Next Issue, a subscription-based iPad app for magazines, finally hit the App Store today after first having launched as an Android app on the Google Play store. Folks need to visit NextIssue.com to create an account and start a 30-day free trial, and then they can download the app to access a bevy of titles from Conde Nast, News Corp, Hearst, Meredith, Time, and more major publishers. A few of the more enticing magazine titles include: Allure, Better Homes and Gardens, Bon Appétit, ELLE, Entertainment Weekly, Esquire, Fitness, Fortune, Glamour, GQ, InStyle, People, Popular Mechanics, Real Simple, Self, Southern Living, Sports Illustrated, The New Yorker, TIME, Vanity Fair, Vogue, and Wired. Next Issue offers two subscription types: the $10 monthly plan only provides the top magazines, while the $15 monthly plan boasts the entire catalog with weekly selections. A quick gander through the catalog shows enhanced digital magazines, which are tablet-optimized and feature bonus videos, photography and interactive elements. Thanks for coming! NYPOST.com editorial content is now only accessible on the iPad through the New York Post App. If you are a current New York Post App subscriber, please visit the App Store and download the latest version to access NYPOST.com through the INDEX. 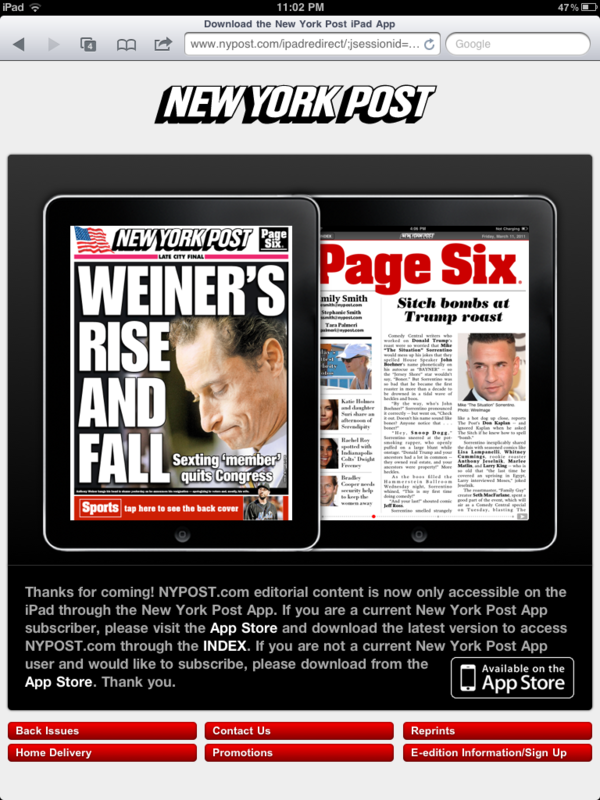 If you are not a current New York Post App user and would like to subscribe, please download from theApp Store. Thank you. Subscriptions run $6.99 per month, $39.99 for six months or $79.99 for the year, with no option for single-issue digital purchases. News Corp also launched The Daily magazine earlier this year, the first Tablet-only daily magazine. If the NYPost wasn’t total garbage anyway, I’d be upset. Hopefully the backlash from this move discourages others from copying this game plan. Interestingly, Skyfire and Opera Mini still work (below). As if today’s pay wall announcement from the New York Times Company wasn’t enough, the news broke that an iPad-exclusive newspaper, The Daily, will begin charging for access next week. Unlike the Times’ entry-level $15 a month subscription for reading online articles on smartphones, the privilege of enjoying The Daily on your iPad costs just 99 cents per week, or forty bucks per year. Rupert Murdoch’s digital-only newspaper is slated to launch in Western Europe by summer, The Guardian reports. The exact release depends on when Apple’s new iOS subscription service becomes available in the country. News Corp sources tell News Corp reporters that News Corp’s iPad app, the Daily will drop on January 17th.